PS-I also see your pigskin cheeseball in the 'you might also likes', that's fun too! Your mandevilla is gorgeous. I had one a few summers ago and I loved it. Alas, it did not overwinter. Your tea time tables are always charming and welcoming. I could sit right down and enjoy the time spent there. 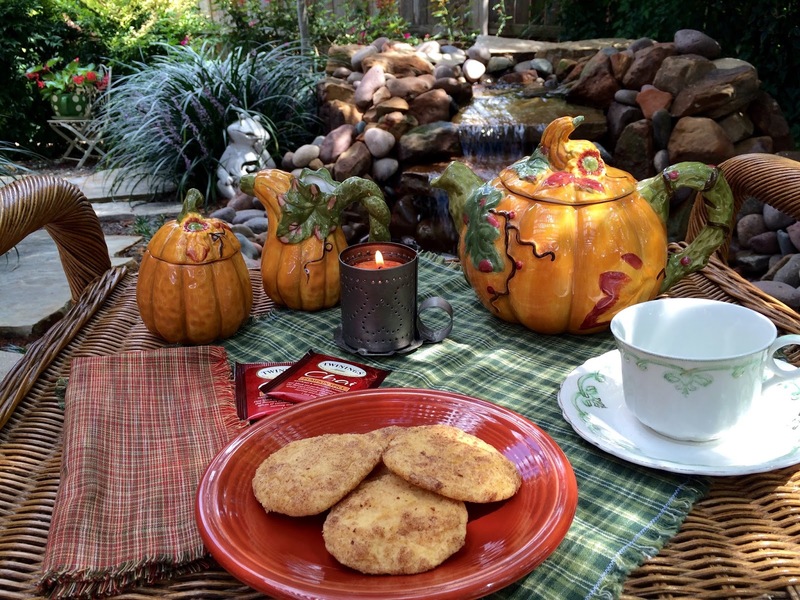 Your snickerdoodle cookies and the tea setting and just so pretty and festive for fall. Good Morning Kitty, Oh I have not made snickerdoodles in a long time and seeing yours has been an inspiration. What a lovely tea and with our matching pots~~~ Love your sugar and creamer to go with it. Just perfect. What a nice fall setting to spend time enjoying an afternoon. Your cup is so pretty and delicate. 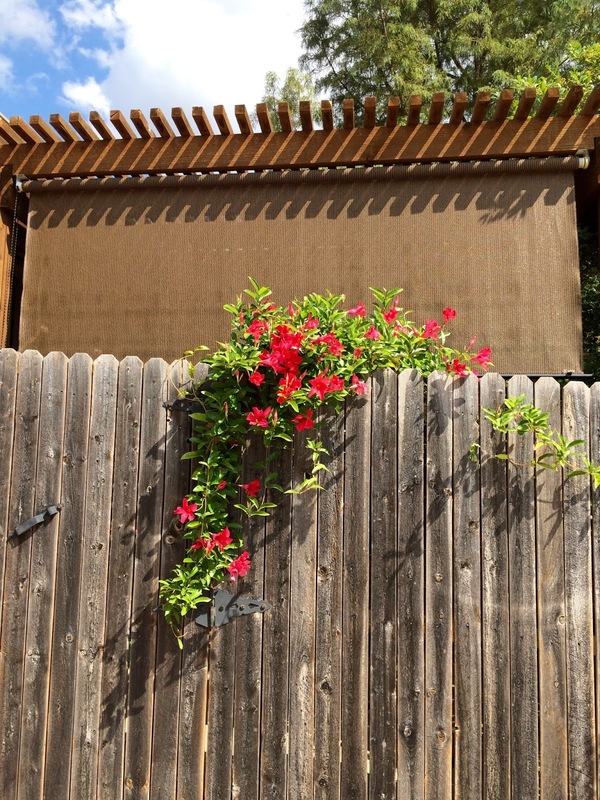 Your mandevilla is beautiful growing and trailing on the fence and yes how nice of your son to install the shade by your patio. I am sure it really helps with our high heat and gives you some nice shade too. Thank you for stopping by and your sweet comment. I will watch the mail and let you know right away. You did not have to do that sweetie. I'll be in touch. Kitty, your pumpkin tea set is adorable and yes, the teacup goes nicely with it! I haven't made snickerdoodles in a long time. Pumpkin would make them perfect for this time of year. Your mandevilla vine is gorgeous. Love the red! 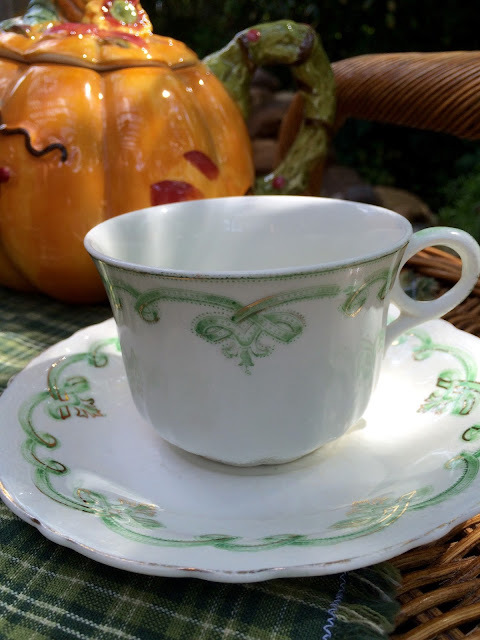 A very charming tea setting, my friend, and how I would love to join you for a cuppa and a cookie! Thank you for joining me for tea and have a beautiful day. That's a wonderful little tea cup there and will also work for Christmas don't you think! 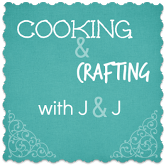 I love your sweet fall tea time table and that recipe looks like a winner to me! So glad you shared Kitty! Very pretty cup. I love the smell of snickerdoodles hot out of the oven. Pumpkin Snickerdoodles! They sound so delicious. Your pumpkin teapot is so sweet! Thank you for sharing with us! I'm pumped up about your pumpkin-themed tea, Kitty! Wished that I can try one of the pumpkin snickerdoodles...I don't think I've ever had a snickerdoodle before?!? I have to try this cookie recipe! It sounds wonderful! I already have the pumpkin spice chai--thank you!!!! I just love all the flavors of fall! As soon as I am done here, I am going to have some chai in my new teacup! It's downright cold in my house right now! Your table looks lovely! And how nice of your son to hang that shade for you! Your vine is beautiful too! Hi Kitty! Everything looks so yummy and pumkin-y! I love pumpkin decorations and pumpkin flavored foods...thanks for the recipe by the way :). It would be so yummy with some pumpkin chai...great idea! Thanks for stopping by my blog. Wow, I would have never thought of adding pumpkin & spices to Snickerdoodles. Can't wait to try them! Your tea set is absolutely darling and just perfect for fall. The entire setting looks very pretty and definitely reflects the season. I totally pinned this! These sound amazing! YUMMY! I really like how you tweaked this recipe. I am a pumpkin fanatic! The teapot is just adorable. I really like the shade your son put up by your pergola. We need one by our backyard table. The sun gets blinding there. That was very kind and thoughtful of him to do that. Enjoy your snickerdoodles! How pretty your Mandevilla vine is...but not as enticing as those pumpkin flavored snickerdoodles!!! What a creative idea...I hope they tasted as delicious as they sound. The tea set is adorable & so, so perfect for the next few months....all the way to Thanksgiving!! You are blessed with having such thoughtful & handy sons. I had 2 lightbulbs burn out in my extremely tall kitchen ceiling & will have to call the fire department to get them changed!! Your pumpkin tea set made me grin as soon as I opened your post. What a great fall vignette you created. The Pumpkin Snickerdoodles sound delicious. Perfect fall setting. I can't remember if I mentioned this - I featured your gingerbread scones on my posy Comfort Food on my Christmas blog, Susie's Christmas Cottage@blogspot.com. Angels to you! Your Pumpkin Snickerdoodles sound like a perfect pairing with Pumpkin Chai Tea, and how wonderful to serve it in a Pumpkin Teapot! Happy Fall! Snickerdoodles made with pumpkin are now on my to-try recipe list. Your tea place setting is warm and welcoming. Snickerdoodles...pumpkin...yummy!!! Your pumpkin tea set is so cute. Love the vine...it looks so bright and looks so pretty over the fence! I love Snickerdoodles! Can't say that I have ever had them 'adjusted' but your recipe sure sounds yummy. :) You have such a sweet place to take tea, Kitty!!! What a great idea Kitty. I never would have thought of that. I love snickerdoodles and these sound wonderful! And I love your green and white teacup and your pumpkin teapot! Thanks so much for linking to Tuesday Cuppa Tea! The teapot and sugar and creamer is perfect for Fall Kitty! I love Snickerdoodles. Adding the pumpkin was a clever idea! Thanks for sharing with SYC. Yes, thank you, I would love to join you for cookies and tea. Snickerdoodles are one of my favorites and with the addition of pumpkin, oh Yum! I would love to join you for some snickerdoodles and tea. Yum! I have the same Mandevilla vine and love it. Does yours make it through the winter? We have to replace ours every summer. Pumpkin snickerdoodle, what a delicious idea! It's time for me to make something pumpkin and these would be the perfect treat to welcome autumn. Thank you for sharing with Roses of Inspiration, sweet friend. Forgive me for just now visiting your. Much love to you! 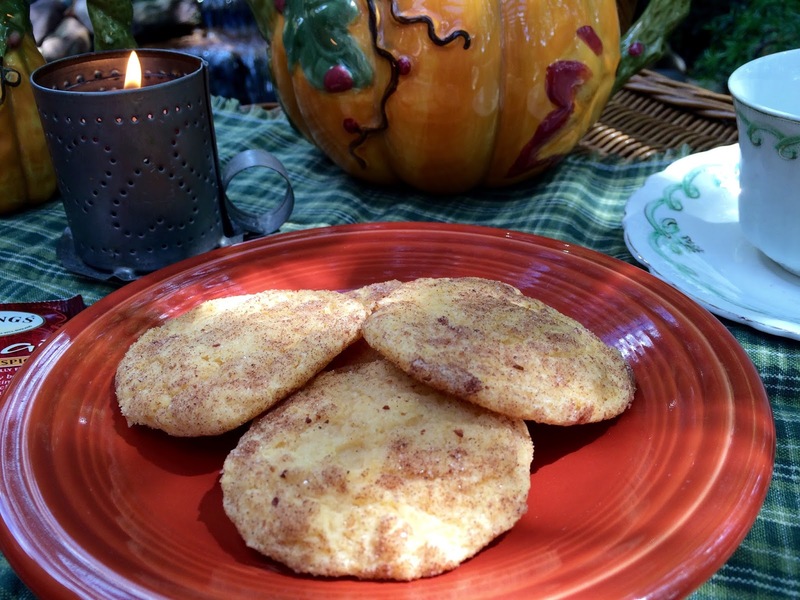 I just love the idea of your Pumpkin Snickerdoodles, they look amazing! I sure hope you are enjoying this wonderful fall weather we are having. Thanks so much for sharing with Full Plate Thursday and have a wonderful day. These sound so good, Kitty. Love your pumpkin tea things. Wish I was there to join you! Sound delicious Kitty! I love the teapot!